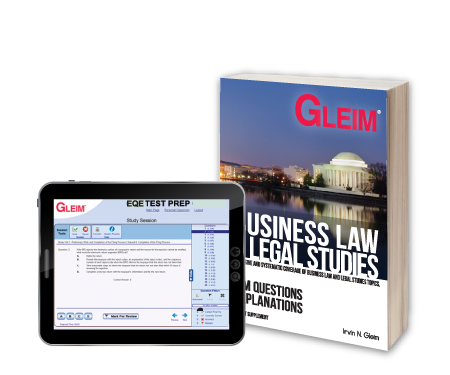 The Gleim Business Law & Legal Studies EQE Book & Test Prep is an integral component of the Exam Questions & Explanations Books & Test Prep set. Outline material and comprehensive practice questions will improve your study process in an intuitive, interactive environment. The Book/Test Prep Set–Business Law & Legal Studies is essential for learning and reviewing the concepts and applications of business law. Students and professionals alike benefit from studying a comprehensive blend of objective questions from certain exams such as the CPA and CMA. Business Law & Legal Studies Exam Questions & Explanations book, 11th Ed. Free With Set. (Optional), EQE Test Prep-Business Law & Legal Studies, 11th Ed.